The Rexel Mercury RSS2232 Shredder is intended for small office use (for up to 10 users) and can shred up to 23 sheets of paper at a time. It has a P-2 security rating so is intended for everyday documents (rather than more confidential material) and it shreds into strips 5.8mm wide. Features include jam-free technology, an induction motor for quiet running, reverse function, easy to use controls, castors so the shredder can be moved easily and a CD tray so you can separate waste for recycling. The pull-out waste bin has a 32 litre capacity and can hold up to 250 shredded sheets. Recyclable bags can also be used with the shredder (Rexel product code 2102505). 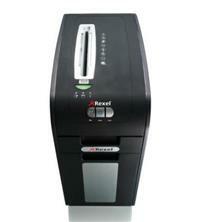 The RSS2232 will also shred a range of media including paper, credit cards, paper clips, staples, CDs and DVDs.